Rosamund Pike physically and vocally captures Marie Colvin to perfection. Her distinctive voice, mannerisms and scars are all authentically on show for audiences to either admire or pity. Pike has always been well regarded as dramatic actress with considerable screen presence, but this surely represents some of her very finest work. She delivers a fearless performance as an equally bold and broken woman, haunted by the physical and psychological damage her chosen profession incrementally inflicts upon her. The film’s main success is in accurately recreating the war zone environments in which Marie Colvin spent most of her professional life. Embedding audiences in the most hostile human environments in precisely the same way war correspondents choose to in real life. It’s sobering and serious material that can’t help but have an emotional impact on those watching. This is most certainly not a film that glamourizes war and its cataclysmic human cost in the way Hollywood is most typically accused of doing. Around Pike’s determined leading performance, a strong supporting cast boasting the likes of Stanley Tucci, Jamie Dornan and Tom Hollander also deliver accomplished performances. The always compelling Tom Hollander in particular is required to give voice most often to the film’s explicit assessment of what Marie Colvin did and why it matters so much. Thanks to their capable hands, the potentially heavy handed dialogue and moralising, feel at least a little more sincere and earnestly delivered. In terms of sincerity, having the film open and close with the real Marie Colvin expressing her relentless passion for journalism in her own words is an especially poignant and impactful gesture. There will no doubt be many who find it hard to identify or sympathise with those who choose to insert themselves knowingly into life or death situations merely to report a story. Some people will surely find Marie Colvin hard to relate too, feeling baffled by why she persisted in pursing stories from war zones, with ever greater personal peril. As with people who climb mountains or throw themselves out of planes for fun, there is a uniquely brave and reckless mind-set required for such activities which few people possess. While that might be inspiring or admirable to some people, for others it will just always appear to be selfishly self-destructive. Those people will of course find Marie Colvin’s own story less compelling or comprehensible. The film is also difficult to watch because it essentially showcases the gradual mental and physical disintegration of an award winning journalist in pursuit of her career. Witnessing her inevitable collapse is slow and painful on screen making the film feel at times more an exercise in endurance than entertainment. Some audiences will consider that part of the message of the film and find that damaged insight compelling, others may struggle more with that grim reminder of reality. 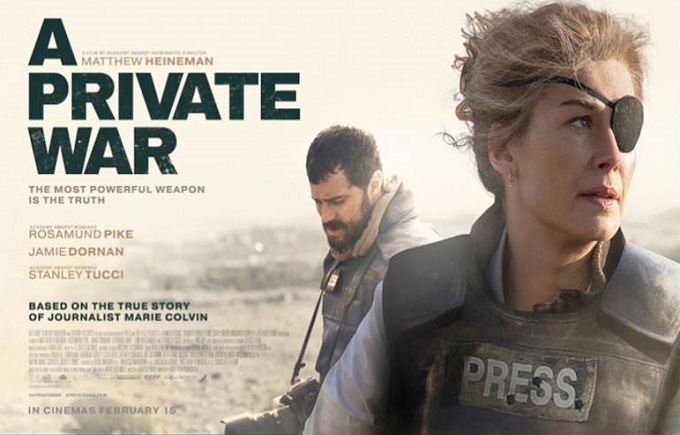 A Private War is a bitingly honest and evocative portrait of a woman sacrificing everything for the cause of journalism. Whether audiences value or understand that decision making, it’s still interesting to see someone making that ultimate sacrifice.